Amazon EC2 and other cloud services are expanding the market for high-performance computing. Without access to a national lab or a supercomputer in your own data center, cloud computing lets businesses spin up temporary clusters at will and stop paying for them as soon as the computing needs are met. A vendor called Cycle Computing is on a mission to demonstrate the potential of Amazon’s cloud by building increasingly large clusters on the Elastic Compute Cloud. Even with Amazon, building a cluster takes some work, but Cycle combines several technologies to ease the process and recently used them to create a 30,000-core cluster running CentOS Linux. Amazon offers its own special cluster compute instances, at a higher cost than regular-sized virtual machines. These cluster instances provide 10 Gigabit Ethernet networking along with greater CPU and memory, but they weren’t necessary to build the Cycle Computing cluster. The pharmaceutical company’s job, related to molecular modeling, was “embarrassingly parallel” so a fast interconnect wasn’t crucial. To further reduce costs, Cycle took advantage of Amazon’s low-price “spot instances.” To manage the cluster, Cycle Computing used its own management software as well as the Condor High-Throughput Computing software and Chef, an open source systems integration framework. Cycle demonstrated the power of the Amazon cloud earlier this year with a 10,000-core cluster built for a smaller pharma firm called Genentech. Now, 10,000 cores is a relatively easy task, says Powers. “We think we’ve mastered the small-scale environments,” he said. 30,000 cores isn’t the end game, either. Going forward, Cycle plans bigger, more complicated clusters, perhaps ones that will require Amazon’s special cluster compute instances. 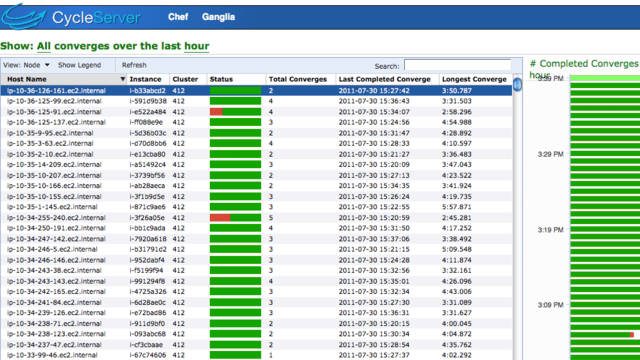 The 30,000-core cluster may or may not be the biggest one run on EC2. Amazon isn’t saying. “I can’t share specific customer details, but can tell you that we do have businesses of all sizes running large-scale, high-performance computing workloads on AWS [Amazon Web Services], including distributed clusters like the Cycle Computing 30,000 core cluster to tightly-coupled clusters often used for science and engineering applications such as computational fluid dynamics and molecular dynamics simulation,” an Amazon spokesperson told Ars. Amazon itself actually built a supercomputer on its own cloud that made it onto the list of the world’s Top 500 supercomputers. With 7,000 cores, the Amazon cluster ranked number 232 in the world last November with speeds of 41.82 teraflops, falling to number 451 in June of this year. So far, Cycle Computing hasn’t run the Linpack benchmark to determine the speed of its clusters relative to Top 500 sites. The task of managing such large cloud-based clusters forced Cycle to step up its own game, with a new plug-in for Chef the company calls Grill. Cycle also hit a speed bump related to volume and byte limits on Amazon’s Elastic Block Store volumes. But the company is already planning bigger and better things.